ViewSonic's NMP-560 Industrial Grade 1080p Network Media Player is designed for reliable 24/7 digital signage applications. 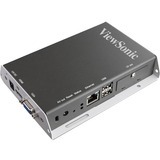 Advanced video hardware decoding supports full HD1080p with HDMI connectivity supporting both video, audio or fixed images. In addition, you can connect to any display having a VGA computer input. This cost-effective solution integrates into your existing network and supports MPEG1/2/4, H.264 video formats. The built-in 4GB storage plus CF slot allows you to install high capacity memory cards for expandable content storage. Content scheduling is easy with ViewSonic's Signage Manager Express software.